Are you ready for a Punch Down? Bobby Flay has his “throw downs”, but are you ready for a “punch down”? No, not in the boxing ring, or on the local school yard, but in wineries across the world. It is harvest time in the northern hemisphere, and in many areas, the grapes have been picked and are nicely fermenting their way to becoming wine. As a quick reminder, fermentation is the conversion of sugar to alcohol. Through the metabolic activity of yeast, the sugars in the grapes are converted to alcohol, and carbon dioxide (as well as a few other by-products, including heat). White wines are typically fermented without their skins and other solids, while red wines are fermented in contact with skins, stems, and other solids. The grapes are put through a crusher and then poured into open fermentation tanks. Once fermentation begins, the skins in the tank of fermenting red wine, are pushed upwards to the top of the must (juice), where they form a thick layer that is known as the “cap”. 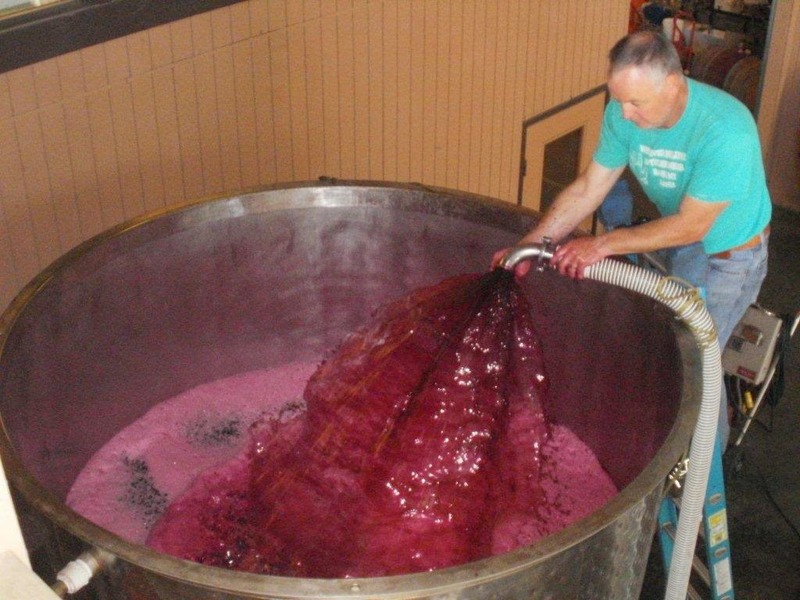 Winemakers want to keep the skins in contact with the must (this process is known as “maceration”). Maceration is the winemaking process where the phenolic materials of the grape are leached from the grape skins, seeds and stems into the must. Since 99% of all grape juice (with the exceptions of teinturiers) is clear, the maceration process extracts the color, flavor and tannins. The cap needs to be mixed through the liquid each day, or "punched down", which traditionally is done by stomping through the cap. Is anyone having visions of Lucille Ball stomping grapes on the old “I Love Lucy” show? The main reason it is desirable to punch down the cap, is that the wine will have a richer color, flavor, and astringency. But there are other advantages…. During the early stages of fermentation, the physical act of punching down, introduces oxygen into the yeast cells, and kick-starts the fermentation process. It also helps distribute the yeast cells throughout the must. Punching down also helps dissipate heat that naturally occurs during fermentation. Red wines typically ferment between 60F and 70F, left alone, the cap can reach temperatures exceeding 80F, which can spoil the wine, and providing an environment that is beneficial to harmful bacteria. If the cap dries out, a bacterial invasion is more likely. One example is the vinegar bacteria, which converts alcohol into acetic acid. This is called “acetification” and will spoil the wine, unless of course, the winemaker is trying to make vinegar. There are two main ways to deal with the cap: punch-downs and pump-overs, but modern technology has added several other techniques. “Pigeage” (pronounced peej-AHJE) is a French winemaking term for the traditional stomping of grapes in open fermentation tanks. Pigeage is typically translated into English as “punching down”. Punching down is when the cap is manually or mechanically pushed back into the juice from the top (obviously an open container is needed). Feet, a punch down tool, paddle or a hydraulic piston can be used to punch down. The most common punch down tool is something like a long handled potato masher. This is both gentle and labor intensive. It is performed at regular intervals during fermentation, and depending on the amount of maceration the winemaker requires, can be done numerous times during the day. The more aggressive the winemaker is, with breaking up the cap, the more a wine will be extracted, dark and tannic. The goal should be to break up the cap and work out all the lumps. When finished, the surface of the wine should be smooth and moist throughout. Historically, pigeage involved placing a wooden beam across the lip of the tank and a worker with the punch down tool, using the beam to step on for balance. Remember that CO2 rises, so the workers could easily be overwhelmed by the CO2 fumes. There have been many reported cases of workers passing out, and falling into the fermentation vats, drowning on the fermenting wine. Nowadays, these vats are smaller fermentation bins, where accidents are less likely to happen. A second approach to maceration is “remontage” which is typically translated into English as “pumping over”. This technique is just as it sounds, and involves pumping the juice from below the floating skins over the cap. This doesn’t necessarily break up the cap, but does keep it submerged. This technique is used for a wide range of wines and is especially common for large batches that would be too difficult to punch down. Generally, remontage is done with a hose that is connected to a spout at the bottom of the tank and pushes wine through a pump and into a second hose that sprays the wine onto the cap. This method does allow more oxygen to mix with the wine, ultimately influencing the final wine product. If a wine is over-sulfured, some aeration would be desirable, as it would help eliminate the off-odors. Another, less common, method of maceration is the "pneumatage process", in which compressed air or gas is injected into the must. The bubbles created during the pneumatage process uses gravity and the weight of the juice to circulate the wine juice with the cap of skins and grape solids allowing for greater extraction of aroma, coloring agents and tannins to diffuse into the juice. Additionally, tanks with built-in grates, that keep the cap submerged in the juice, and rotary fermenters that turn constantly during fermentation, are in use. The newest method is known as “Rack & Return” This method is uncommon, as it requires the use of two tanks. In this case, half of the wine in a tank is moved to another tank and then returned to the original tank, at a high velocity, using a pump at full speed, causing the cap to break up. In general, maceration takes about 2-3 weeks. At some point the cap will stop forming, and the solids in the wine will start to sink, instead of float. This happens because fermentation is slowing down and there are less CO2 bubbles to push the solids to the top. Depending on the style the winemaker intends to make, there is a balance. The winemaker wants to extract as much potential from the solid materials in the wine as possible, but if he/she extracts for too long, the wine can become bitter, because it begins to extract tannins from the seeds, and not just the skins. Then again, if he/she extracts for too little time, the wine may not be as complex as it could be, generally producing a more fruit-forward, than complex, wine. When the winemaker has determined the end of maceration, the wine needs to be separated from the skins and seeds in the tank. The first step in this process is to drain the wine from the fermentation vessel. This is known as the “free run” wine, and is generally considered to be the finest portion of the finished wine. The remaining juice and solids will be gently pressed, and is known as “pressed wine”. 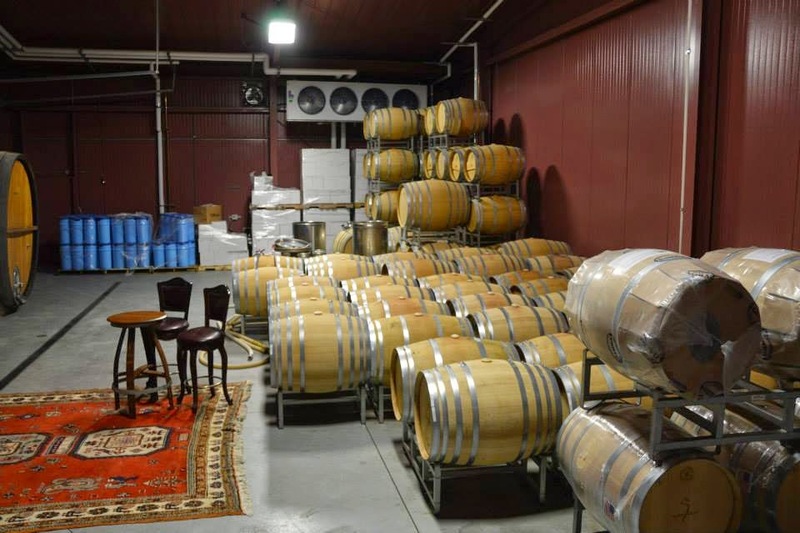 As you can see, there is a lot that goes on before the wine ever makes it into the oak barrels, and begins its’ aging process (but not all see oak, or aging), and it is all going on right now. The smell of fermenting wine is one of the wonderful experiences of visiting wineries this time of year…and I highly recommend it! I have already filled you in on our day one tastings, and the four wineries we visited, as well as our second day in San Miguel, along with those five wineries. Sunday is a day when most of our group heads back home, but I have always made our trips into four days, to maximize the number of wineries we can visit. With a smaller group hanging around, I can concentrate of smaller wineries, and don’t have to make appointments. Often, my Sunday visits are based on recommendations from other winemakers, or “through the grapevine recommendations”, such as blogs from other wine writers. This trip was no different. I put together a few wineries for the “wish list” then built the list as the day progressed. This time, all our tastings were focused on wineries along Hwy 46 West. Our first stop of the day was at Brian Bensen Cellars. Since they open at 10:30, we were able to get an early start. Their tasting room adjoins Dark Star’s tasting room and gift shop. The tasting room is pretty stark, and has a very “young vibe” to it. The wines are intense, and focused on red grape varieties: Syrah, Grenache, Mourvedre, and Primitivo, with varying percentage of each in different blends or single variety. Each bottle is labeled with Brian’s artwork. Price points run from $35 to $55 per bottle. I picked up some of the Kandy Red (Grenache/Primitivo) and Tryst (Grenache/Mourvedre). The tasting room person suggested that we check out Caliza, Jack Creek Cellars and Shale Oak. So, our next stop was at Caliza Winery, just up the road. Caliza Winery is located right next to two well respected wineries in Paso Robles: L’Aventure and Booker. Caliza follow sustainable practices in their vineyard, and their focus is on red varieties, and a little bit of Viognier and Rousanne. The wines are mainly Rhone style blends. While tasting, the winemaker/owner, Carl Bowker stopped in the tasting room for a short visit. Their wines are priced between $23 and $54, and have an elegant style to them. Here, I picked up a unique blend (Grenache, Syrah, Mourvedre, Petit Sirah, and Tempranillo) known as Azimuth. The tasting room staff recommended that we try Booker (next door) which was appointment only, but we couldn’t get anyone on the phone, so moved on to our next stop. Stop number three was at Treana Hope. This winery creates five different labels: Liberty School, Austin Hope, Treana, Candor, and Troublemaker. The large, barn-like tasting room has a huge gathering area, and the actual tasting room is located in the back, with windows looking out into the vineyards, and the large surrounding oak trees. Let me warn you, there are a lot of wines to taste here, and your best bet is to split with someone, so you can have a small taste of each. The different wine labels offer price points for everyone. The entry level Liberty School brand is under $20, while the Austin Hope and Treana brand peak out at about $45. Their Troublemaker brand is unique, in that it is made from blended vintages and varieties consisting of Syrah, Grenache, Mourvedre, and Zinfandel. Here I picked up some Liberty School Chardonnay (great for everyday drinking at $14) and some Treana Cabernet/Syrah. Our next stop was at Turley Wine Cellars. This is probably the best known winery, that we visited during the day. This large production, organically certified winery, is known for their Zinfandels and Petit Sirah. They have tasting rooms in both Paso Robles and the Sierra foothills. Their wines, while mainly Zinfandel, come from numerous vineyards, all over the state, and, if you aren’t already a believer in terroir, then this will be an eye-opener to the differences between locations. I must say, I still favored their Zinfandels sourced from the local Dusi vineyards. Some members of our group walked out with cases of wine here. We also took advantage of their covered picnic tables and enjoyed the spread of food we had packed into coolers for the day. After lunch, we headed to Jack Creek Cellars, where we had been hearing about their Pinot Noirs. They are located on the far west side of Paso Robles, where there the marine influence is more prevalent. While we came for the Pinot Noirs, that is not what I purchased. I like more Burgundian style Pinot Noirs. These were pretty fruity Pinots, so if you like that style, definitely check them out. What I found interesting was their Chardonnays. One was fully fermented in concrete, so no oak influence, crisp, and minerally. The one I purchased was the estate bottling. These wines sat on the lees for eight months, yielding a yeasty, finished product, with nice acid, and just a touch of oak. Very elegant in style. I also picked up some of their Grenache and Syrah (some of the best we had tried on the trip). Next up was Cypher Winery. Cypher is right on Hwy 46, and have just moved into their newly renovated tasting room. The décor had a similar feel to that of Brian Bensen. It is geared towards a young consumer. Hip music playing, dried grapevines hanging from the ceiling. The wines matched the eccentric look of the tasting room., with blend names like, “Anarchy”, “Heretic”, “Zinbitch”, and “Loco”. The wines are typically Rhone and Bordeaux style blends, with a few single variety Tempranillos, Zinfandels and Chardonnay. These are rich, big wines. I picked up their Anarchy blend (Zinfandel, Mourvedre and Syrah). Our last stop of the day pushed us right to the 5:00 closing time for most wineries. We had been hearing about Shale Oak Winery since Friday. A number of winemakers suggested we get there and try their Petite Verdot. This sustainably certified winery is a zero impact winery, from the vineyards to the tasting room. The wine lineup goes from Albarino to Rose to luscious reds. The rumors about their Petite Verdot were correct…dark cherry, smooth and just the right amount of tannins. Then came their red blend named “Ku”. Wow! Shale Oak was the way to finish day three of wine tasting. It was a quick trip back to the hotel, then off to dinner at Artisan. Artisan is often recognized as the best restaurant in Paso Robles, so we were looking forward to the meal. We must have caught them on an off day, as the service was extremely slow. The food was good, but nothing compared to the previous night at Bistro Laurent. Day four was our final day, and we packed up the cases of wines purchased, and headed south. Our typical breakfast stop is at Hoover’s Beef Palace in Templeton. As we soon found out, the restaurant will be shutting down in November, as the new owners of the building will be tearing it down to build low income housing. I hope the owners of Hoovers will find a new location, because we will follow them there. As we drove down the coast, we stopped at Dragonette Cellars just in time to catch the winemakers finishing up the de-stemming of the latest harvest, then off to Turiya for a special tasting (which I wrote about a few weeks ago). As always, a great trip to the Central Coast. Eighteen wineries visited. Great meetings with winemakers, owners, and friends. I hope you will take this series of notes, and check out some of these fine wineries and restaurants. Last week, I shared our first day itinerary for our four day trip to the central coast wine country. Saturday was the only day that our entire group would be together for all the tastings. 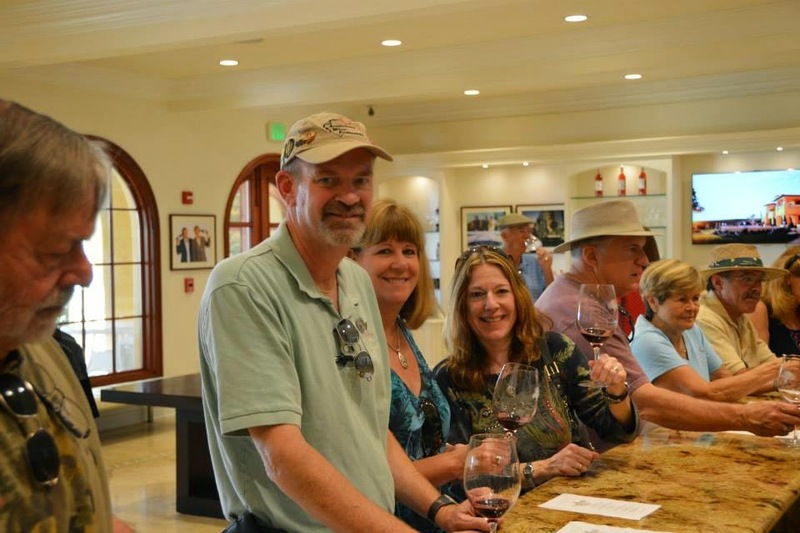 I had been working with the Wine Wrangler, in Paso Robles, to create a full day of wine tasting and education. Their largest van held 24 people and we maxed that out with our group. 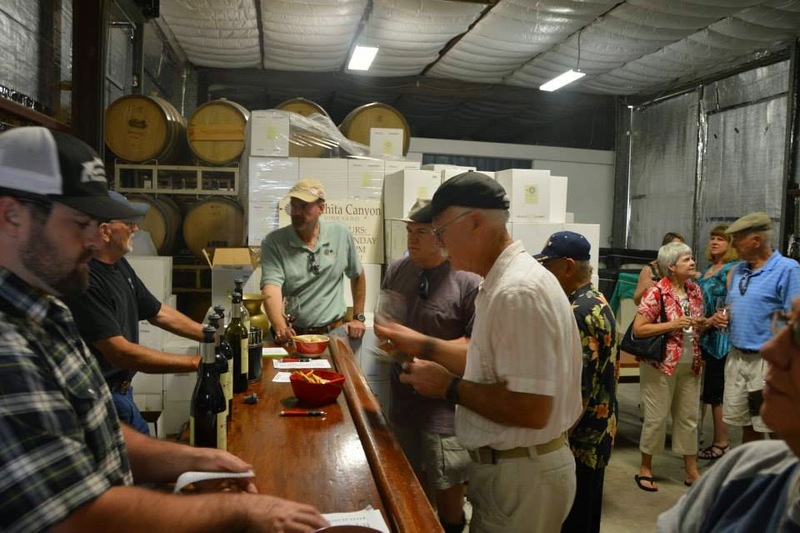 The planning included five wineries, and lunch, along with all the transportation. Our morning started off with breakfast at Margie’s Diner, which is located right next door to the Black Oaks Hotel. This is definitely a place to avoid if you are on a diet. Their breakfasts are huge, and what is with those egg dishes? That can't be a three egg omelet! You've been warned. At 10:00am our van showed up and we headed out to San Miguel. San Miguel is one of the proposed districts, within Paso Robles. 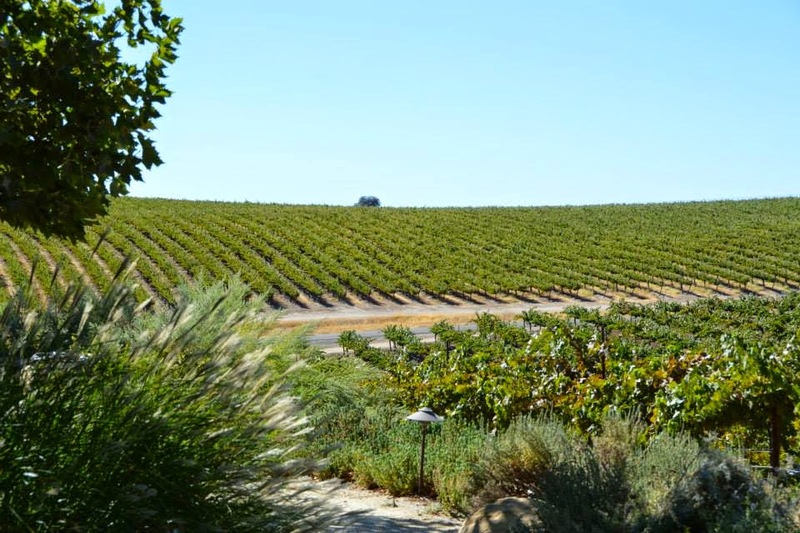 It is located in the northeast corner of Paso Robles, and covers about 1,500 acres. The best I can tell, there are about 16 wineries/vineyards in the area, but only about eight have tasting rooms. As we drove up Highway 101, we turned off at the exit to the San Miguel Mission. The Mission San Miguel Arcángel was established in 1797 by Franciscan monks, and lends its’ name to the area. The San Miguel area has a very mild marine influence and only receives an average of 11.4 inches of annual precipitation (second lowest district in Paso Robles). This low level is largely a function of the rain shadow created by the Santa Lucia Range to the west. The area is dominated by alluvial fans, and well-defined terraces, that were formed by the Salinas and Estrella Rivers (which are completely dry due to the recent drought). Elevations range from approximately 580 (the lowest elevation within the Paso Robles AVA) to 1,600 feet. Our first stop of the day was at Ranchita Canyon Vineyard, where we were greeted by the owner/winemaker, Bill Hinrichs. Ranchita Canyon Vineyard was planted in about 1970, as a “retirement plan”, according to Bill. They have south facing vineyards, on rolling hills at 1,000 to 1,400 foot elevation, with primarily chalky, calcareous soil. The Hinrich’s are farmers first, and winemakers second. Their attention to canopy management, pruning, and harvest, show in their grapes, and ultimately in their wines. We tasted at least 15 different wines, and some members in our group helped punch down the latest grape harvest. 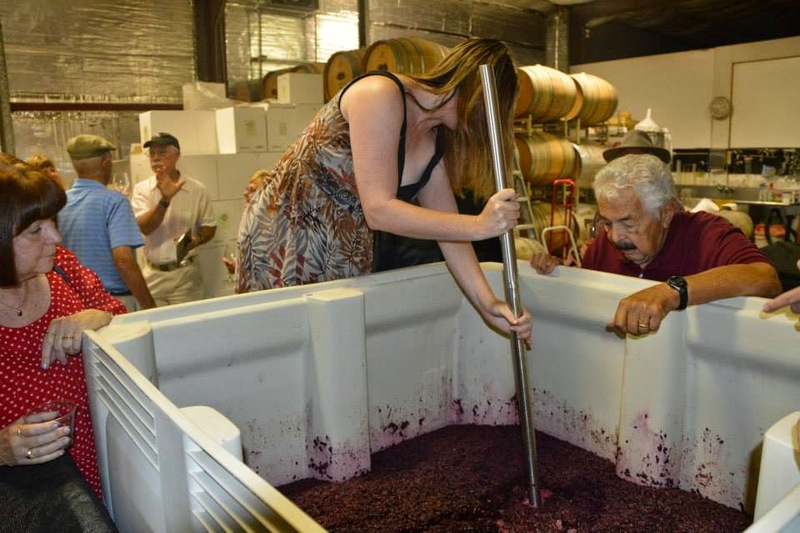 Bill joked that if any of the women fell in while punching down the fermenting grapes, he would label that batch of wine as a “special reserve”. All their wines were well made, and worth tasting. I saw a lot of bottles purchased by our group (and this was only our first stop!). I particularly liked their Albarino and Zinfandels, and blends (“Divin”). They also made a nice “Port” wines. Our second stop was right next door at Villa San-Juliette. Villa San-Juliette is a beautiful, 14,000-square-foot Tuscan-style estate, located at the top of a 168 acre vineyard. What many may not realize is that this winery is owned by Nigel Lythgoe (American Idol and So You Think You Can Dance) and Ken Warwick (American Idol). 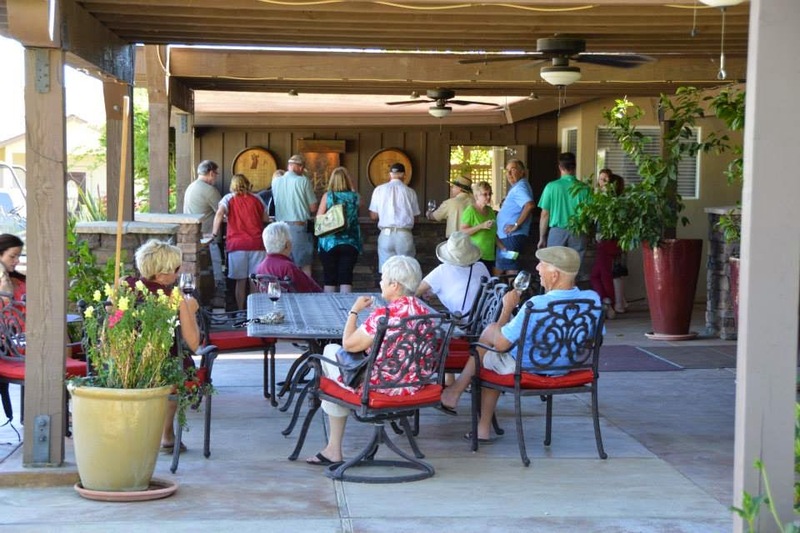 The tasting room is very ornate, and is set up for large groups to taste, shop, and relax. The large patio was perfectly set up for our lunch break. The wine styles are rich, and express the varietal character and soil of the area. I particularly enjoyed their Reserve Rose and a blend of Malbec, Petit Verdot and Cabernet, that they call “Romantique”. As you might expect, with the expansive facility, their pricing is on the upper end, but these reds will hold in the cellar. The third stop was at Silver Horse. This small winery had the largest amount of tasters in the tasting room. Our group ended up splitting into two groups: one in the tasting room, and the rest in the cellar room. Unfortunately, there wasn’t much discussion from the tasting room staff, about the wines. For my taste, they were too oaky. I did purchase two of their blends, as I want to see how they will work with food. I purchased the Tomori and Sage (both red blends). The higher acid levels might work well with food…time will tell. Our fourth stop was at Graveyard Vineyards. Now if you are like me, you read the name, and thought this might be a gimmicky name, for average wines. You’d be wrong. As we entered the gates of this hilltop property, we passed the old Pleasant Valley Cemetery, which dates back to the 1860’s. As we arrived at the tasting room, we were directed off to the side, next to a large pond, and under the shade of a large tree. Live music was playing, and two servers poured tastes for the group. There were probably 15 wines to taste from both Graveyard and Bushong (the winemakers own label). As we worked our way through all the wines, we were presented with “special” brownies, which we learned were made with the Graveyard “Deliverance”, a chocolate infused “Port” style wine. As expected, the indoor tasting room had many graveyard related sales items, and being this close to Halloween, many of our members took advantage and purchased a few things. I purchased their Zinfandels, Chocolate Port, and an interesting Bushong blend, a rose of Tempranillo and Grenache. Our final stop of the day was at J & J Cellars, a small family owned winery, that has been growing grapes for over five generations. Once again, these are farmers, that are making wine from their 114 acres of vineyards. Their indoor tasting room has a nice variety of wine related accessories, and they also have an outdoor patio, with tasting bar. Their tasting included a range of grape varieties including Malbec, Tempranillo, Zinfandel, and Barbera. While I was in purchasing a bottle of Cabernet Sauvignon, I was told they opened a bottle of Petite Verdot, that (as I learned after the fact) was excellent. It was getting close to 5:00pm and time to head back to the hotel, and get ready for our dinner reservations at Bistro Laurent. We had two tables reserved on the outdoor patio, and the temperature was perfect for a summer evening in Paso Robles. Bistro Laurent never fails to amaze. This is one of the finest restaurants in the central coast wine region. We opted for the five course meal, with all courses professionally paired with wine by the Sommelier, Ian Adamo. I have written about Ian, and Chef Laurent in previous blogs, but I must say, once again, they have it all going on here. An outstanding meal, and end of day two, of our weekend in the Central Coast. If you haven’t checked out the wineries in the San Miguel area (soon to be its’ own district) I encourage you to check them out. This less traveled area is making fine wines, has less crowds, and a better opportunity to meet with the owners. Next week, I will fill you in on what I call my “adventure day”. The day I set out to visit the wineries that winemakers suggest. Never knowing what we may find. Click here for day three.